For French country cooks and Parisian gourmets, flageolet are a favorite bean. The attractive pale green color and delicate flavor make it a versatile addition to soups, salads and vegetarian dishes. Traditionally, Flageolet is used as an accompaniment to roasted leg of lamb and French cassoulets. 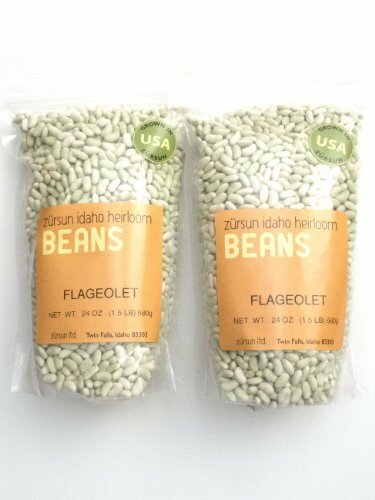 These heirloom beans are grown on 300 small-scale farms in the Snake River Canyon region of south central Idaho known as the Magic Valley Growing Area. The area's arid climate; rich, well-drained loamy soil; moderate temperatures and stable moisture level produce pure, distinctly flavorful beans, superior to common store-bought beans. They are continually inspected during the growing season for plant health, pure strains and consistent appearance. Beans are fresh from the field and impeccably clean. The producers' passionate focus on producing the best-quality beans ensures an amazing, high-quality bean-eating experience. Produced by nature and cultivated by world cultures through thousands of years, heirloom beans are untouched by genetic science or modern technology. Today there are over 10,000 known varieties of heirloom beans and legumes that have been handed down from generation to generation. Discovering and enjoying heirloom beans helps preserve traditional varieties for future generations. If you have any questions about this product by Zursun Ltd., contact us by completing and submitting the form below. If you are looking for a specif part number, please include it with your message.